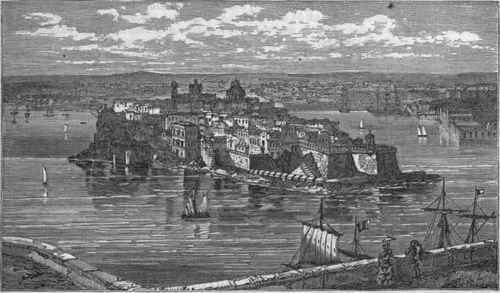 Valetta, Or La Valetta, a seaport town, capital of the island of Malta, on the N. E. coast, in lat. 35° 54' N., Ion. 14° 81' E.; pop. about 60,000. It occupies an elevated peninsula between two harbors, the one on the east, called the Great harbor, extending about 2 m. inland. Five forts command the approach by sea, and five lines of fortifications, mounting 1,000 guns, and hornwork, extend across the isthmus. The ground upon which it stands is very uneven, and the streets are connected by flights of steps. The cathedral was built in 1580, and is exceedingly interesting for its numerous monuments in marble and bronze, paintings, and curious relics. The keys of Jerusalem, Acre, and Rhodes are deposited in it. There are 19 other churches. The palace of the grand master of the knights of Malta is now the governor's residence; it contains a corridor hung with the portraits of the knights, an armory with many kinds of ancient armor, and a library and museum adjoining. The university was founded in 1838, and has faculties of divinity, law, medicine, and arts. There are naval, military, and civil hospitals. The other buildings most worthy of notice are the exchange, theatre, several auberges or separate palaces of the knights, and the house of industry.. A great aqueduct supplied Valetta with water from Citta Vecchia, 8 m. distant. The botanic garden is in the suburb of Floriana. The burial grounds have been formed out of the bastions of the fortifications. The opera house, erected at great cost a few years before, was destroyed by fire in May, 1873. (For the commerce and history of the city, see Malta, and Valette).